Sponsored lunches are a great way to maximize your conference experience. 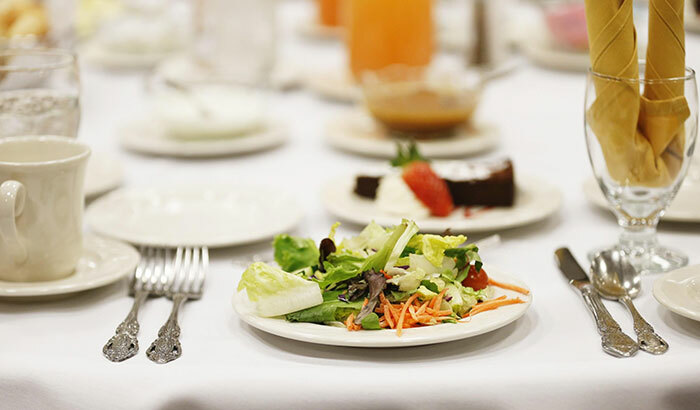 These lunches are an optional, paid event for RootsTech attendees. Seating is limited, and tickets are required. Reserve your seat at a sponsored lunch event as you register online. Sponsored lunches are $38 each. Wednesday, February 27, 2019, 12:00 p.m.
Topic: Come hear about the future of FamilySearch from chief technology officer Craig Miller. From new record sets to mobile apps and other emerging digital technologies, Craig will explain the ways in which FamilySearch is making family history available and applicable to people around the world. Thursday, February 28, 2019, 12:00 p.m.
Topic: Our Stories Start with YOU. Join us for a lively discussion and luncheon hosted by Dr. Gates, host of Finding Your Roots, Harvard professor, and the preeminent scholar of the African American genealogy community. Topic: How to Make the Most out of DNA Testing. With over 30 million people who have taken a DNA test, we explore how you can make the most out of DNA testing and what this means for your family history efforts. We’ll discuss as an audience some key questions on the future of genetic genealogy and how family history will never be the same again. An interactive lunch event with a few surprises. Friday, March 1, 2019, 12:00 p.m.
Topic: Connecting with Your Mayflower Roots: Resources. Although the 400th anniversary of the landing of the Mayflower is still a year away, the New England Historic Genealogical Society has already begun to deliver inspiring educational experiences, authoritative scholarship, unique searchable databases, and new ways to connect with fellow Mayflower descendants. Hear how we are marking this milestone, discover the interactive resources, and learn about a new online tree program that will make tracking all of your ancestry even easier! Saturday, March 2, 2019, 12:00 p.m.
Topic: All the Cool Things BYU Does with Family History. From a four-year bachelor’s degree to library resources, from innovative computer applications to the ability to publish your family history, BYU offers a variety of services for students, researchers, and the public. Learn more about how BYU is educating, exploring, and innovating in the field of family history. Topic: From learning more about what ancestry you inherited from your parents, to comparing your Neanderthal-ness with friends, 23andMe offers a variety of ways for customers to connect, share, and compare their results. In this lunch session we’ll explore the various reports and tools 23andMe offers and show examples of how they can be used to to answer a variety of questions.